New technology and better materials have meant that garage door design has come a long way in the last few years. Having a functional door no longer means you have to compromise on style, and with a little searching you are sure to find a beautiful design within any budget. If your garage needs an update this Spring then have a look at the latest trends, and contact us if you need help finding a style you love. Wooden garage doors are making a huge comeback, thanks to trends returning to warm, natural materials. Timber doors exude an understated elegance, and look especially beautiful on homes that have existing wooden features – just make sure to match the colour and grain of the wood. With both traditional and modern styles available, you can find wooden garage doors to boost the curb appeal of almost any home. 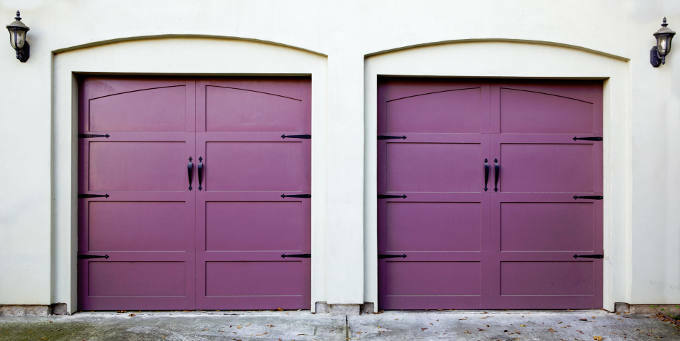 Just like brightly painted front doors, there has been a huge uptake in bold colour choices for garage doors. Where homeowners have previously tried to make their garages blend in, the trend has turned and garages are now a beacon of property personality. If you’re tired of traditional shades then this spring could be the perfect time to pick up a tin of chirpy ochre or shocking turquoise and make a statement. Unsurprisingly, more and more people are deciding they don’t want the hassle (and sometimes grubbiness) of manually opening their garage doors. Remote-controlled automated doors are the most popular choice, as the technology can be applied to almost any kind of door. For some people, clicking a button is still too much effort and so there are now systems that use your smartphone to simply open the doors when you’re nearby. Likely motivated in equal parts by a desire to save the pennies as well as the planet, savvy homeowners are asking about how to make their garages as energy efficient as possible. The answer is to properly insulate garage roofs and doors, and arranging repairs as soon as they’re required. You might be surprised by how much heat is lost through a garage attached to your home, so when the time comes for a new door, find a design that provides plenty of in-built insulation.